This looks like a delicious and comforting soup. Thank you Jovina. Really is a delicious soup. I just pinned this. Not only does this soup look delicious (and good for you) but your photos are excellent. And I know how hard it can be to photograph something like soup. Thank you so much Cecile! What a lovely comment. Odd though…although I received your comment it is not showing up on my blog post! You are right, soup can be very shiny and hard to photograph. :) Thank you for pinning. It is odd that my comment didn’t show up on your blog post… I hope it DOES show up! It finally did show up! Thank you! I want that soup now Seana, I have saved this recipe onto evernote it is such a wonderful soup. The flavors I know just pop, wonderful!! Thank you so much Suzanne! Hope you get a chance to make it, you’ll love it. full of lovely flavors! I love this soup! I’m such a meatball fan and these were fantastic simmered in broth. You are right, the flavors are lovely. The rice was brilliant in the meatballs, some of it spread into the soup. So nice to hear from you John! Actually it was great to see your post the other day, it’s been quite some time! Thank you so much for stopping by and saying “hi”! Seana, I have added this to my “to make” list! I do love all your recipes, and I am a HUGE soup fan! We hit 84 degrees today here in Central Oregon. Crazy, right? But we’ll probably have snow next week for all I know. Seana, if you ever come visit your friends here I’d love to hook up with you! We could do some cooking together for a lunch or something! Hi Seana, we are back in Phoenix had a really dry summer in Yachats. Love cloudy days and pots of soup. I have never made this type of soup before, pinning for later. Take care! Oh yum, lerrrrve a good meatball soup! Have never heard of albóndigas but it sounds like our kind of meal. We’re still completely obsessed with Mexican food after our trip, so I’m definitely going to give this a crack! Oh my… Seana, your description of the flavours in this soup has me yearning for a bowl right here and now. It looks SO good! This is new for me too Seana, but I loooove the sound of the meatballs with rice and zucchini in the tomatoey broth. It will be a while before I get soup weather again, but I’ve saved the recipe in anticipation. Since I saw your soup recipe I’ve been thinking about the style of food in correlation to climate. The Thai people eat lots of thin but aromatic soups. I think I’ll try your recipe sooner than I originally thought! I love the description “murky”. That is exactly what we are experiencing today. Bog comes into mind too. We’ve had crazy rain this morning. Perfect soup conditions. Thanks Nicole! 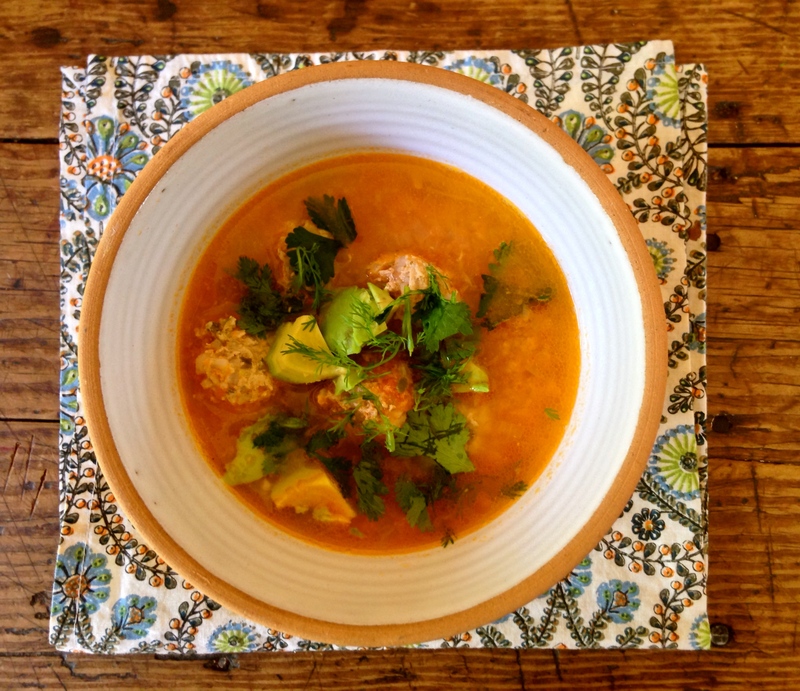 Hi Seana– love, love the look of this soup! All those beautiful greens on top and it seems light and warming at the same time– Sadly for us it’s was 104 degrees here yesterday! in October! So I’m am tucking this recipe away for the first chilly weekend here. It looks like something we’d love. thanks. This sounds like a delicious soup…the weather doesn’t even have to be cool to entice me to enjoy a bowl of it. Hi Arthur! Hope you are doing well. Thank you for saying hi! Thank you so much! It’s a wonderful Mexican soup, hope you give it a go sometime Sarah. :) Still dreaming about your bundt cake. I just have to make it! Mwatball soup is awesome. Very nice work my friend!! …or even “meatball” soup would’ve worked quite well there. Abondigas. Even the name is beautiful. Lovely looking soup. I never heard of albondigas soup, is it Spanish? I like the idea of putting the rice in the meatball . Ready for soup season and this one looks so flavorful and satisfying! Me too! Over the weekend I prepared two different soups. My poor son said…”soup again?” But, thank goodness he always enjoys it! Wow! Looks perfect for a chilly afternoon! I’m putting this on my soup list!! That’s exactly what he would do!! I’m the only vegetarian in the house….the little folks and dad are not so this dish is perfect for them! oh wait…aren’t you vegetarian Kari? It’s definitely soup season over here. And this sounds delicious. Never knew that about adding soaked rice to the meatballs. That’s bound to help soak up all the juices (as they cook) and keep the meatballs moist. Will have to remember that. I use ground rice in vege burgers and stuff. Not quite the same effect, but along the same lines. It’s too fine to really soak up any flavours though. Oh, and I love your fabric squares you’ve used. And your soup looks really well dressed, too. That can be really difficult! Soup season here too! Matter of fact I made soup 3 times in the past 7 days. I think we may live in very similar climates. I imagine adding ground rice to vege burgers would help to keep the ingredients together, great idea! Wonder why you were getting the ‘page not found’ prompt…The last two posts went out a little odd. I had to edit the publish date and time after I published the post. Odd. It posted with a date a few weeks earlier which put the post way down on the reader list! eek! Clearly it’s time to get to know this soup better. I love discovering new specialties! Just seeing the photo and reading the list of the ingredients, I am in love with this soup. I have always been lover of meatballs. Yum! One of my favorite soups! Pinning for later, of course! 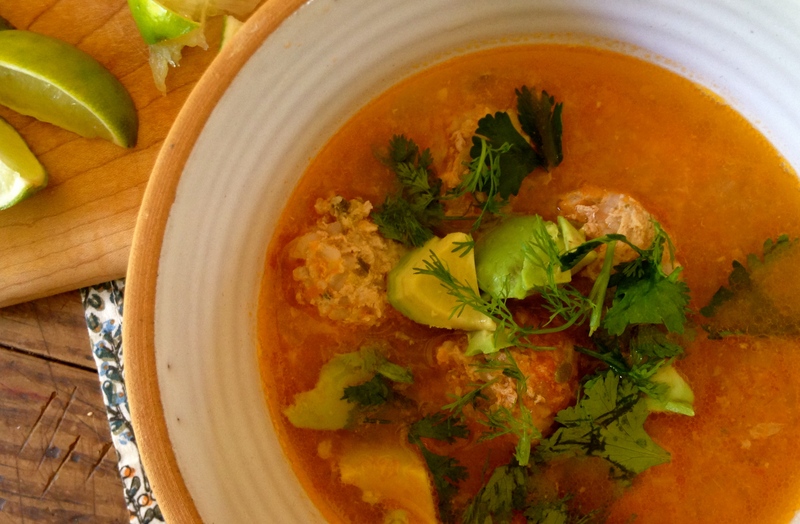 You are currently reading albóndigas soup at COTTAGE GROVE HOUSE.